Joyce limit switches allow you to set precise travel limits and stops on Joyce jacks and actuators. They are also ideal in any application where rotary motion of a machine component can be used to indicate linear motion of another part. 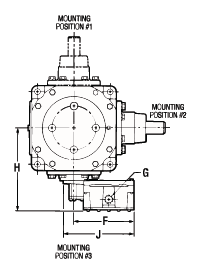 They are compatible with 2-ton through 150-ton jacks, actuators, electric cylinders, and integrated actuators. LS7 limit switch has two single-pole, double-throw (SPDT) switch contacts. This switch offers a NEMA 4 rated enclosure – rated for dust, rain and hose directed water, To set switches, first remove the cover plate and the “L” bracket, then manually rotate the cams to desired positions, This switch is compatible with integrated actuators. Directions for setting LS7 limit switches and schematic. LS8 limit switch has two or four switch contacts and is available with single-pole, double-throw (SPDT) switch contacts, or double-pole, double-throw (DPDT) switch contacts. The LS8 limit switch is best suited for general-purpose applications requiring up to four switch contacts for operating motors, lights and other accessories. It is available in two models: the LS8 402 (two switch model) and the LS8 404 (four-switch model). 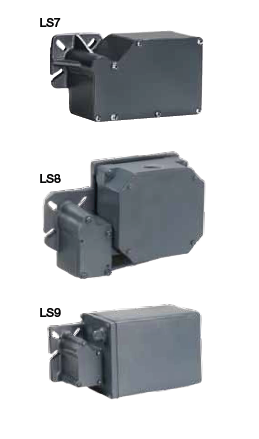 Both LS8 models offer NEMA 4 rated enclosure – rated for dust, rain and hose directed water. To set switches, first remove the cover plate tnen simply loosen a cam detent screw and rotate the switch trip cam to the desired switch adjustment posiition. Watch video and learn how to mount a LS8 limit switch to a Worm gear jack. Since limit switches are mounted directly onto jacks and actuators and their specific selection is dependent on ratio and rise, they are specified as part of the complete part number. Refer to the ordering section for the products on which they will be used. Note: Joyce/Dayton offers other products with integral limit switches. The features of these products are described in their respective product sections - Linear actuators (LA), Multipurpose Actuators (MA), Solar Actuators (SA). 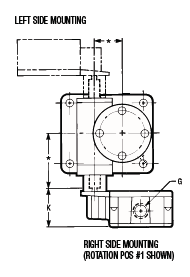 Limit switch mounting positions for jacks , actuators, and electric cylinders. 2, 2.5, 3, 5, 10, 15 and 20 ton jacks and electric cylinders are available with positions #1, #3, #5. 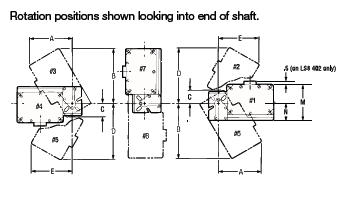 25, 30, 35, 50, 75, 100 and 150 ton jacks are available with positions #1, #4, #7, and #8. 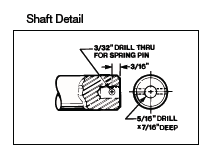 25 kN, 50 kN, and 100 kN jacks are available with positions #1, #3, #5. 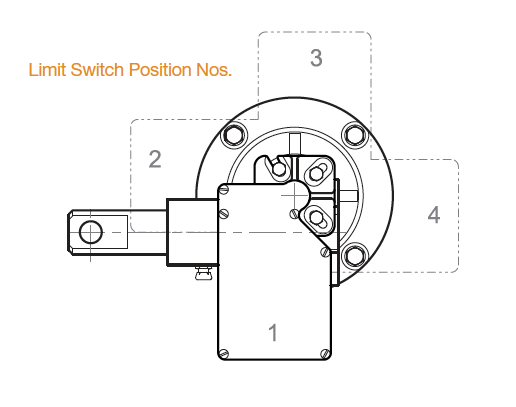 Limit switches can be mounted in positions #1 through #8 on Bevel Gear Jacks and Bevel Ball Actuators.